Detects And Alerts You To RF Bugs And Wiretaps! Phone Outlets, Electrical Outlets, Phones, Lamps And Other Appliances! The new generation SpyTek RF Ink Pen Detector gives you a highly portable RF working pen bug detector and a UV light detection function that let's you quickly check any marked item such as electrical outlets, phone outlets, lamps or other electrical appliances for tampering. The working and functioning covert pen bug detector can quickly sweep a room with a wide sweeping range up to 3.0 Ghz! However, that's just the start of the amazing functions found in this new covert countermeasures detector that every TSCM sweep team will want to have! It has an all important built-in UV light function that completely tamperproof's everything. By marketing the screw head position of electrical outlets, telephone jacks, the bottom screws on phones and lamps (see photos below) you can quickly and easily know in second if the item has been tampered with by using the quick UV light function on the bug detector. A free UV marking pen is included. Aside from quickly sweeping a room with the covert pen detector up to 3.0 Ghz, this small pen detector will fit in your shirt pocket gives you amazing countermeasures sweeping and detection power. 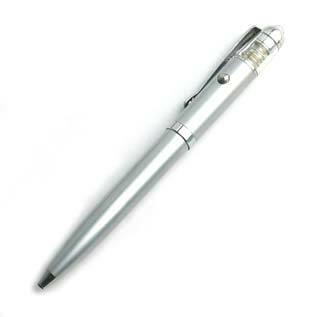 Not only that, only you have to know that what you carry is a new generation bug detector built into a functioning pen! You can also use it to quickly detect counterfeit currency. • Use as a bug detector to sweep a room! • Works As A Functioning Pen! • Covert in nature! Functioning pen so only YOU know it's real functions. 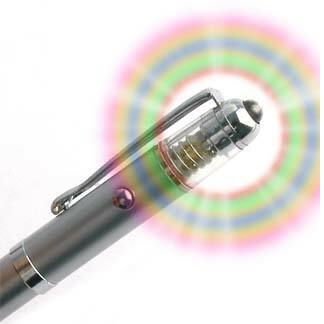 • Currency checker And UV pen marking detector for Tamper-Proof Function. • Functioning ink pen so unit is covert in nature! When doing countermeasures sweeps, you check and clear an electrical outlet, phone jack or electrical light switch. You can then mark the screw heads with the included invisible UV pen. Once that is done, all one has to do is check the screw head with a UV light source built into the functional pen covert bug detector to know in an instant if the outlet has been opened. Below are sample photos to better understand this technique. The above photo of an electrical outlet shows a marked cover under normal conditions and under the UV light. Note the location of the screw head. The UV mark shows that when the cover was cleared, the screw head had a vertical line. The screw head now has almost a horizontal line which means that the screw head has been turned. This is a strong indication that the cover has been opened. In such a case, the cover would need to be removed and checked again. 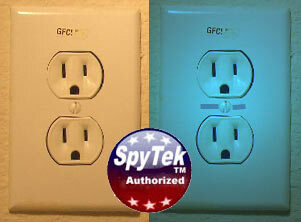 The above photo of an electrical outlet shows a marked cover under normal conditions and under the UV light. Note the location of the screw head. The UV mark shows that when the cover was cleared, the screw head had a horizontal line. It's still the same so the screw heads on this cover have not been moved which means the cover has likely not been opened. The pen automatically detects wireless signals and alerts you with a red flashing light at the tip of the pen according to signal strength the flashing will be more frequent. Push the button on the side of the pen to illuminate the UV light to check for counterfeit currency by detecting the water mark. You’ll never have to worry about turning the pen on to detect a signal it is always on detecting for you. You will love the simplicity, covertness, portability and tamperproof functions of this unit! Use it yourself or buy in small wholesale bulk to give to your clients when the countermeasures job is over. They will remember you forever for that and be highly impressed! The secret is safe with you but it's in your ball park now! Get your little countermeasures gold mine today! 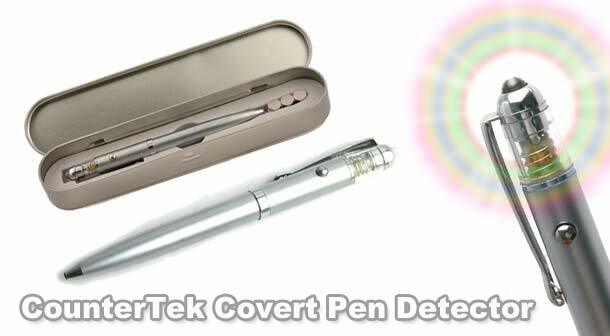 One SpyTek RF Pen Detector With Tamperproof Function! Lots Of 10, 20 and 50. Call 512.719.3595 for pricing. 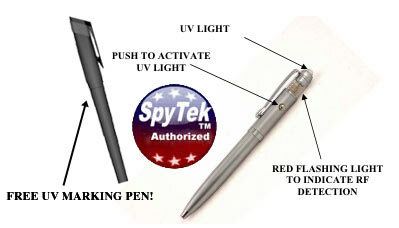 Please Note: SpyTek Pen is a trademark claimed by SpyTek And The Spy Exchange And Security Center. If you are interested in becoming a dealer for new generation SpyTek gear, email: RThomas007@aol.com for information on the complete SpyTek dealership program. Photos And Web Graphics Are Imbedded With Security Code That Notifies Us Of Any Other use On The Internet. 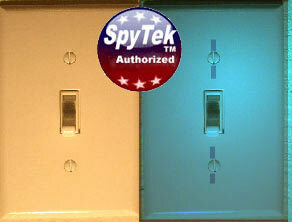 The graphics, text, script photos and HTML code is for use by authorized SpyTek Dealers only.